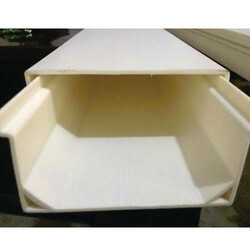 We provide Hi Grp End Cap for NFT Channel to our clients. These end caps are without a spout. They are designed for NFT channels and are easily installable. They make the channels leak proof. Higro End Caps are made of UPVC material as they are easy to remove and reinstall for the cleaning of the NFT Channels. Higro Plastic NFT Channel with Lid gully facilitates the Nutrient Film Technique by allowing a thin film of the oxygenated nutrient solution to flow along the base of a flat bottom gully surface from which the plant root system can be fed. These UV-stabilized NFT gullies have a long life with proper maintenance and care. They have a perfectly modulated lid and have optimum growth space in the channel that enables sufficient root growth as well as headspace to meet the oxygen requirements of a rapidly growing plant. Being a leading enterprise of this industry, we are offering a huge range of Higro Plastic NFT Channel with Lid to our clients. Looking for NFT Channel with Lid ?